Forget any crazy pizza combo the US could dream up -- Italy has proven again that it singularly owns pizza. According to the AP, a nearly mile-long pizza containing 1.5 tons of mozzarella, 2 tons of tomato sauce, and weighing a total of 5 tons in all, debuted at Milan’s world fair, Expo 2015, this past Saturday. 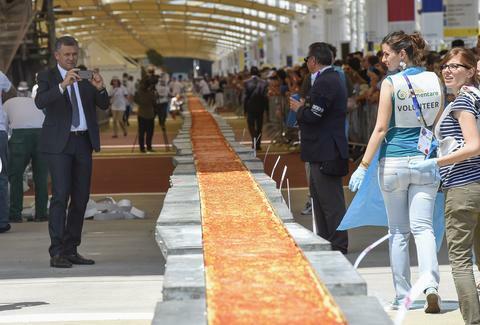 It took 60 of the country's best pizza makers 18 hours to put the ridiculously long Margherita pie together, and a Guinness World Records judge was on hand to confirm that it beat Spain's record for the world's longest pizza (theirs was 1.1415km long, which is decidedly unimpressive). Lucky fair attendees were handed free slices of the epic pizza, which you can see in the video below. Good luck ever enjoying your regular-size, plebeian pizza the same way.